Cynthia Figge's SB'13 Plenary speech "New Insights into the Correlation Between CSR and Brand Strength" follows. Hello! I’m so grateful to be meeting with all of you, and celebrating my 7th year at SB since New Orleans!! Why are we all here? Because we believe that a company that invests in sustainability increases its brand value, right? I’m going to unveil some research that proves the relationship between brand and CSR is even more profound than we thought — around the world, across industry type, and company size. Even more exciting, last year, that correlation more than doubled in strength. My company, CSRHub, the world’s largest aggregator of global CSR information, ran five years of our data against the data of Brand Finance, the global brand analyst headquartered in London. With our overlapping datasets, we analyzed over 1,000 companies, and for 2012 we got a .28 correlation between brand strength and CSR. This seemed extraordinary. So we tested the data. My co-founder at CSRHub is a self-admitted geek with degrees in physics and astronomy, and a Harvard MBA (where we met) and he knows his regression. He looked at F values. He split the data in two groups. Tested the combined effect of outliers. He tested for spurious relationships. He ran regressions with third factors such as enterprise value and market cap. Over all these trials, the correlation holds. 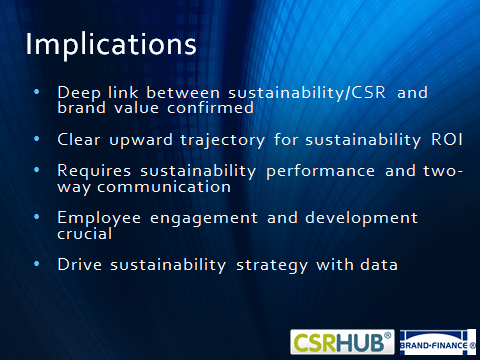 28% of brand strength is related to CSR performance. Let’s dig in and discover which CSR factors may be driving brand strength. We looked at each of the twelve factors in CSRHub’s model. 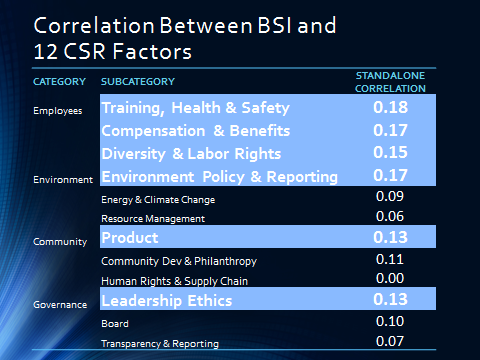 This chart is ranked by the four categories employees, environment, community and governance. Look closely at the subcategories in light blue. One of the highest correlations is between brand and Environment Policy and Reporting. This is not at all surprising given the environmental crisis – and companies tend to communicate about this in their sustainability reports. They also tend to communicate about products and leadership ethics, the two bottom blue stripes. But the highest correlated subcategories are all employee issues. Employee engagement and word of mouth seem to be extremely important in creating brand value. 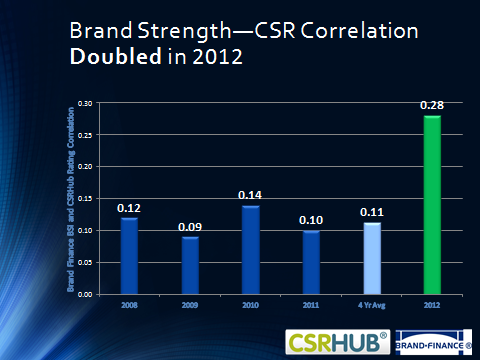 Brand strength to CSR correlation has suddenly strengthened in the last year, doubling in 2012 over 2011. The relationship stayed relatively constant over the previous 4 years. Then in 2012 that correlation more than doubled. Why? Perhaps we are reaching critical mass. Consumers are more aware of sustainability. It’s been in the press more. More sustainability websites like CSRHub are out there. NGOs are talking more about the role of corporations in their success. My son just graduated from college and he takes sustainability as a driver of business success for granted. You’re the one audience that really gets the implications of this data. 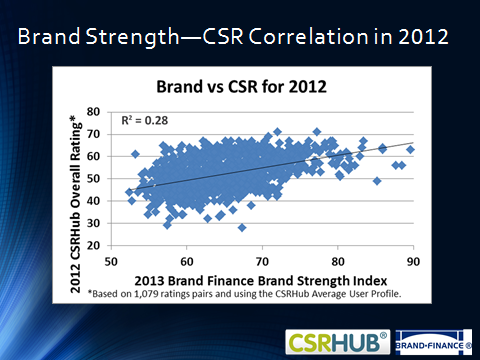 CSRHub and Brand Finance have proved a deep link between CSR and brand strength. There is DRAMATIC ROI for sustainability. And that ROI is increasing rapidly. 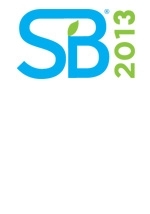 My take is that more companies see sustainability as the breakthrough platform for strategic advantage. After strategic sustainability consulting for 17 years I believe we may be at the edge of big shift. Cynthia Figge is a forerunner, thought leader and speaker on the corporate sustainability movement. As the co-founder and COO of CSRHub, Cynthia's team provides free corporate sustainability ratings on over 7,300 publicly-traded and private companies worldwide. In addition to CSRHub, Cynthia is the co-founder of EKOS International, one of the first consultancies to integrate sustainability and corporate strategy. She has crafted corporate sustainability strategies for a host of major organizations, including BNSF, Boeing, Coca-Cola, Dow Jones, and REI. 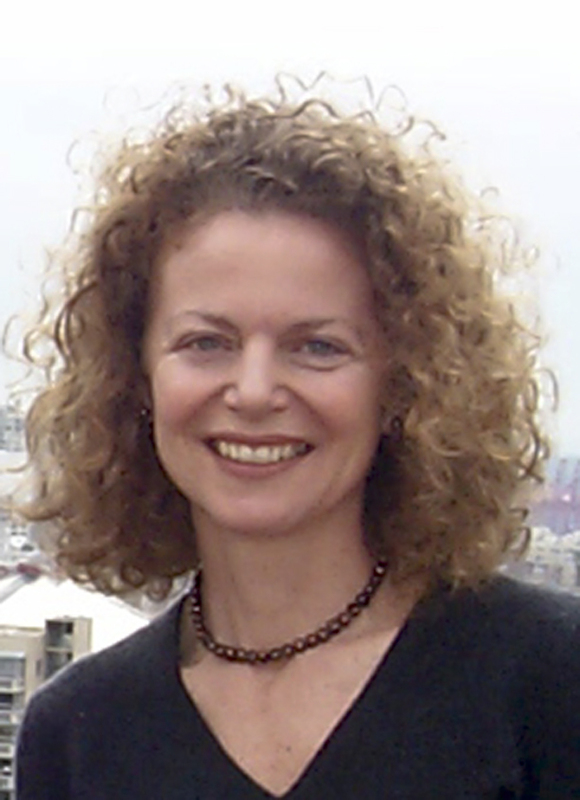 Cynthia also serves as an advisor to SNS Future in Review, Board Director of Compassionate Action Network, and served as President of the Board of Sustainable Seattle. She has an MBA from Harvard Business School. Prior speaking engagements in corporate responsibility have included SRI Basecamp, Future in Review, Sustainable Brands, and SRI in the Rockies.